The most beautiful thing about this world, and indeed humanity is the freedom to choose. And in the smoking world, the choices of different brands of smoke make the passion very appealing. For this reason, windy city cigar is ever attentive to the need of our customers that we look for the best premium brands for them. In this post, we will be talking about the Black & Mild Cigars; we will let you into what makes these cigarillos so delightful and why you need to include it among your favorites. 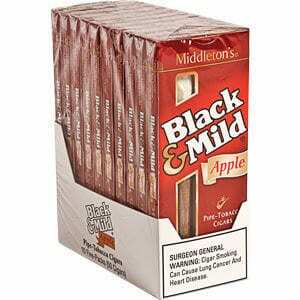 What stands Black & Mild Cigars Apart? Excellent ingredient. Like it or not, cigar qualifies as a food item for smokers, and as sane humans are interested in what goes into making what they eat, smokers should know what makes up their cigar. 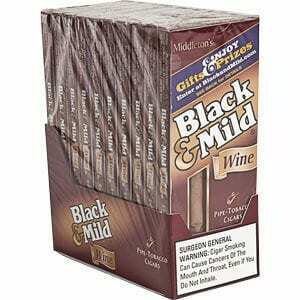 Therefore, Black & Mild Cigar uses broad-cut black Cavendish, burley and golden Virginia tobaccos. These combinations of high-grade ingredients give the cigar its distinct taste and pleasant aroma. The quality of this cigar is contained in the process of its making and believes of the maker to offer smokers the pleasure of finding their choices in its flavors. Of course, the real feeling and cool experience of any smoker is the distinct taste they get. Otherwise, just any smoke would do if cigar smoking is all about puffing the smoke; but it’s not! Therefore, one way you know you are in the company of great guys who understand what they want and living life on their own terms if the variant of flavors you get where there are Black & Mild Cigar enthusiasts. Thus the flavors are in Mild, Cream, Apple, Cherry, Wine, Cherry Pipe Tobacco, Cream Pipe Tobacco, Wine Wood Tip, Classic, Shorts, Gold, Mild and Sweet Cigarillo. Informed cigar enthusiasts are wise people! They know that living life is not necessarily about being a millionaire or having a truckload of raw cash; it is about flowing with the wind. Therefore, they create a tantalizing mix of distinct flavor thanks to Black & Mild. Not only that, they find the right cigar store where premium quality is guaranteed to have what they want with the assurance of quality. Why should you pick a cigar with a name? Smoking is more than lighting a stick and puffing the smoke; it is about the connection with something more prominent than the cigar itself; it is called association! Humans as creatures of association and you better associated with the right group otherwise you find yourself to blame. With Black & Mild Cigar you are in the company of great people who respect appreciates every stick you smoke as a reminder of great union through the brand. 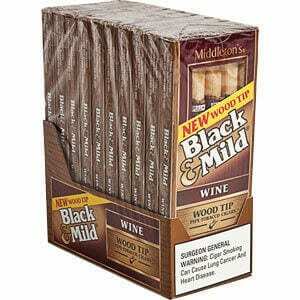 Black & Mild has its history traced back about 169 years ago thanks to its originator John Middleton. His experience in the tobacco business developed into filling the market gap that will produce such brand that will satisfy the majority of needs of the average smokers. The product of that exercise is Black & Mild Cigars! 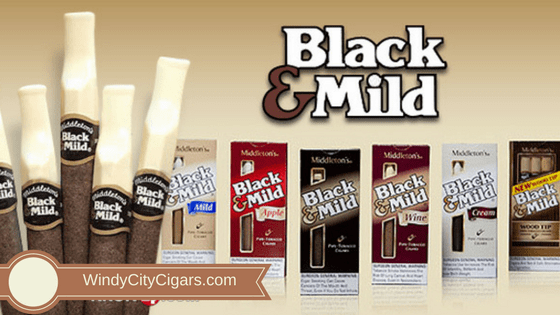 Why should you buy Black & Mild Cigar? The cigar was born out of innovation. The concept to produce cigar from pipe tobacco makes Black & Mild cigars different from all cigars in the market. The cigar is aimed at giving traditional cigar enthusiasts an alternative. This innovation is solving the major challenge with cigar smoking; no more tamping, packing and fiddling like you do with conventional cigars. Yet, you enjoy the better aroma, fantastic flavors, and refreshing taste. Quality ingredients. The cigar leaf is sourced from the tropical climates where the best quality of tobacco leaves is produced. The thickness, tastes, and textures of the tobacco leaves are so diverse to provide choices of high-quality tobacco blends to make the cigar. In the midst of so many premium cigar brands available in all conceivable shapes, sizes, strength, wrapper variety, flavors, and country of origin finding that excellent new cigar can be daunting a task. This is the reason Windy City Cigar store stocks high-quality premium cigars and educates you about what stands them apart. We don’t just stock any brand; we sell the only brand with history and credible record because of your health matters to us. We offer assortments of all Black and Mild flavors in different sizes to satisfy your urge of quality cigars with distinct flavor appeal. Our collection of Black & Mild (listed below) offers competitive prices and best quality because your satisfaction matters to us. When you’re searching for a quick and tasty yet affordable cigar the Black and Mild Cigars is a bargain you need to consider. These mellow machine-made and smooth treats offer a delightful experience for flavor premium connoisseur or any pipe enthusiast. This entry was posted in RYO LifeStyle Blog and tagged black and mild, cigarillos, Cigars, ryo, smokers, smoking, tobacco.